American DJ Inno Color Beam DJParts - All Variety of Parts that DJ Needs. • 108-Watt high output LED Moving Head Beam effect with 36x 3-Watt LEDs • 2 DMX Channel Modes (1 or 13 CH) • 3 Operational Modes: DMX-512, Sound Active or Master/Slave • Dimming: 0% - 100% • 13.5-degree Beam Angle • Pan: 630-degree; Tilt: 220-degree • LED DMX 4-Button menu system • Stepper motors with micro stepping • Omega included for attaching a clamp • 3-pin XLR In/Out • Fan cooled • Strobe/Pulse effect; random strobe slow to fast • Compatible with American DJ UC3 Series easy-to-use controllers (sold Separately) • IEC AC IN/OUT on rear to daisy chain power • Extreme long lifetime of the LED (50,000 hr. 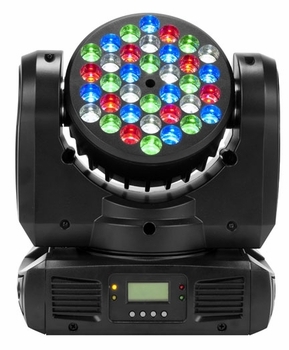 rating) • Multi-voltage Operation: 100-240V, 50Hz/60Hz • Power Consumption: 110W max • Light source: 36x 3-Watt high quality CREE LEDs (8x Red, 10x Green, 10x Blue & 8x White) • Dimensions (LxWxH): 12”x10.5”x6.75” / 304x262x168mm • Weight: 13 lbs. / 5.8kg.